That is such a cool picture, in part because I can’t even tell that it’s Raleigh. Brand new building and new angle, with new acorn location. Nice! Yes, without context, I’d wonder who took our Acorn. The lighting is great in this photo. Is there a construction cam online for the Dillon? I thought the one for Skycam was pretty interesting to keep up with. I was downtown a couple weeks ago and they had poured alot of the initial concrete foundation columns. Interested to watch this projects’ progress. Hi Guys, Im new here, at least to this site. 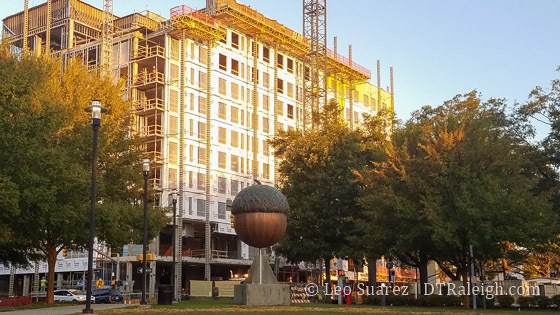 Have lived in Raleigh for 13 years now and so far, Raleigh is Slowly shaping up to be a great City. From (NYC) Im used to taking Mass Transit, But Now its seems that Driving is the way to get around, had used CATbus and personally, You Guys need Better Transit here in Raleigh, Just Saying. Not trying to step on any toes here, Buy why stop at building high rises at 20 stories tall? Very few High rises as I walk around Downtown, Maybe that will soon change, as everything else in Life I guess.